On March 30, 2018, we had a Q&A Interview with George Vaillant, MD, eminent Professor of Psychiatry at Harvard Medical School, long-term Director of the Study of Adult Development, and author of ten books including his newest, Heaven on My Mind. Prospection refers broadly to the mental representation and evaluation of possible futures. For more information, read Seligman, Railton, Baumeister, and Sripada’s (2013) foundational paper, “Navigating into the Future or Driven by the Past“. ABOUT HEAVEN ON MY MIND: Using the Harvard Grant Study of Adult Development to Explore the Value of the Prospection of Life after Death. 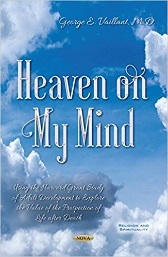 In Heaven on My Mind: Using the Harvard Grant Study of Adult Development to Explore the Value of the Prospection of Life after Death George Vaillant explores the fact that Heaven fascinates us. Yet we lack any empirical information about it. Why, despite our multiple faith traditions, does Heaven have such positive connotations for us all? Why, despite no tangible evidence, should autobiographies by authors who claim to have visited Heaven, usually through near death experiences, attract literally millions of readers? Why does virtually everyone, even non-believers, agree with the old adage that There is nothing better than Heaven? Since a picture is worth a thousand words, Heaven on My Mind focuses more on true stories than on explication. In this book, George Vaillant shows how the prospectively gathered spiritual and religious biographies of the men in Harvard’s legendary Study of Adult Development (The Grant Study) cast light on the significance of faith and hope for love in Heaven in real lives. Vaillant intends to show that putting the newly discovered concept of prospection together with our ancient faith in heaven allows us to understand the value of ruminating on an afterlife. Indeed, the life histories of the 184 men followed for their lifetime in Harvard’s path-breaking Study of Adult Development faith in Heaven is significantly associated with leading more successful lives. Due to recent advances in neurophysiology, the study of prospection reflects a paradigm shift in our understanding of the human mind. Prospection reflects the fact that the brain combines incoming information with stored information to build mental representations of the external world. Marty Seligman and his colleagues’ book, Homo Prospectus (2016) revolutionizes modern psychology and supplants the past oriented psychology of Skinner, Freud and cognitive psychology with future oriented psychology suggested by this recently discovered neuroscience. It is prospection that allows us to fight the next war, not the last war. Vaillant received a Templeton grant to study prospection by reanalyzing The Harvard Study of Adult Development (The Grant Study). Since 1939, the landmark Grant Study has conducted a prospective in contrast to retrospective lifelong social and medical study of a cohort of healthy college males. Heaven on My Mind uses these spiritual and religious biographies to illuminate the significance of faith and hope for Heaven. In short, Heaven on My Mind reflects the natural history of the men’s religious affiliation and their prospection of, and expectations about Heaven over the course of their lives. ABOUT GEORGE E. VAILLANT, M.D. 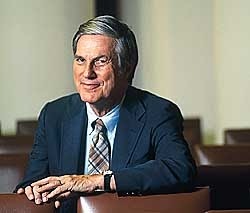 George E. Vaillant, M.D. is a professor of psychiatry at Harvard Medical School and directed Harvard’s Study of Adult Development for thirty-five years. He received his medical degree from Harvard Medical School, did his psychiatric residency at the Massachusetts Mental Health Center, and later completed psychoanalytic training at the Boston Psychoanalytic Institute. The American Psychiatric Association has honored George with its Foundations Fund Prize for Research in Psychiatry. He is also the recipient of the Strecker Award from the Pennsylvania Hospital, the Burlingame Award from the Institute for Living, and the Jellinek Award for research on alcoholism. In 1995, he received the research prize of the International Psychogeriatric Society. He has been a Fellow at the Center for Advanced Study in the Behavioral Sciences, a Fellow of the American College of Psychiatrists and an invited speaker and consultant for seminars and workshops throughout the world. Over the last 40 years, George has written numerous books, arranged below in order of first publication date (some have been updated, with different subtitles). His earliest, Adaptation to Life (1977), is a summary of Grant Study data up to subjects’ 47th year. It has become a classic text in the study of adult development and has been translated into several languages and republished over the years, most recently 1998. His Natural History of Alcoholism: Causes, Patterns, and Paths to Recovery was printed in 1983, with a “revisited” version appearing in 1995. Ego Mechanisms of Defense: A Guide for Clinicians and Researchers came out in 1992. The Wisdom of the Ego was issued in 1998, and 2003 brought Aging Well: Surprising Guideposts to a Happier Life from the Landmark Harvard Study of Adult Development, which is a summary of Grant Study data up to their 80th year. Spiritual Evolution: A Scientific Defense of Faith, first published in 2008 became Spiritual Evolution: How We Are Wired for Faith, Hope, and Love in the 2009 paperback version. 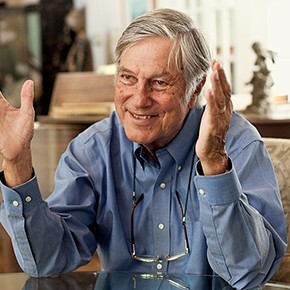 One might wonder about factors in George’s own background that led him to his life work as a researcher and director of the Grant Study and to the multiple lifetime achievements noted above. He was born in 1934 in New York City to academic WASP parents who employed a nurse, a maid, and a cook during the Great Depression. His father was a “hotshot” archeologist who met his American-born mother, a banker’s daughter, in Mexico City. When George was a toddler, his father gave up working at Aztec digs and became a curator and then director of major metropolitan museums in the U.S. George remembers his father as “accomplished,” with little evidence of doubt or depression. Several years later, George’s family received his father’s elegantly-bound Harvard College 25th reunion book. George remembers being spellbound as he (at age 13) studied the photos and descriptions of men’s lives from their graduation to age 47–a twenty-five year perspective. He was fascinated with the changes he saw over time. As a teen he attended Philips Exeter Academy and went on to Harvard College, majoring in history and literature. His initial interest in the longitudinal process was further developed after medical school in his psychiatric residency, where he learned a literary approach to human lives, practiced deep reading of individual cases, and was intrigued by cases where he could track changes in severe mental disorders over time. He also trained in experimental science for two years in a Skinnerian laboratory, learning to read cumulative behavioral recordings. So George was prepared with clinical practice, theory and research skills. He appreciated the discovery possible from examining data taken in real time within a longitudinal study, and was prepared to operate with few initial premises, constantly changing variables, and no overarching framework, as was the case when he the Grant Study. Most of all, he was already a natural storyteller, and the Grant Study was ready to share its findings. His narratives of the men’s lives, created from lengthy interviews he conducted, were expertly woven together with observations and theoretical interpretation. George still operates out of the Grant Study’s office when he’s in Boston, and works the phones to track lives and deaths of the Grant Study men. He has been married to his present wife, Diane Hinghum, MD for 40 years, and they live in Orange, California. He has 5 adult children and one step-daughter.